Tufts Amnesty International hosted a keynote and panel discussion about solitary confinement and human rights in Barnum Hall Monday evening. The event, entitled “Voices from Solitary: Think Outside the Box,” was presented in partnership with the Institute for Global Leadership (IGL), the Jonathan M. Tisch College of Citizenship and Public Service, the Consortium of Studies in Race, Colonialism and Diaspora, the Department of Peace and Justice Studies and the Tufts American Civil Liberties Union chapter. According to its Facebook page, the event aimed to “present a discussion of the different facets and experiences of solitary [confinement],” as well as address the current movement to make solitary confinement illegal. Stina Stannik, president of Tufts Amnesty International, explained why the organization decided to put together the panel. The keynote speaker for the event was John Artis, co-founder of Innocence International and co-defendant in the case of Rubin “Hurricane” Carter, an American middleweight boxer wrongfully convicted of murder in 1967. In Artis’ keynote address, he discussed his experience with incarceration. Artis explained that solitary confinement meant that an inmate would be locked up alone in a room, sometimes without windows, for 24 hours a day. Inmates could be given an hour for recreation and 15 minutes to bathe, meaning that a year of solitary confinement could result in around 12.5 combined days outside of the cell, he said. “Untold men and women are in prison…simply because they’re black,” he said. After Artis spoke, the event’s panelists were asked to introduce themselves, according to Stannik. 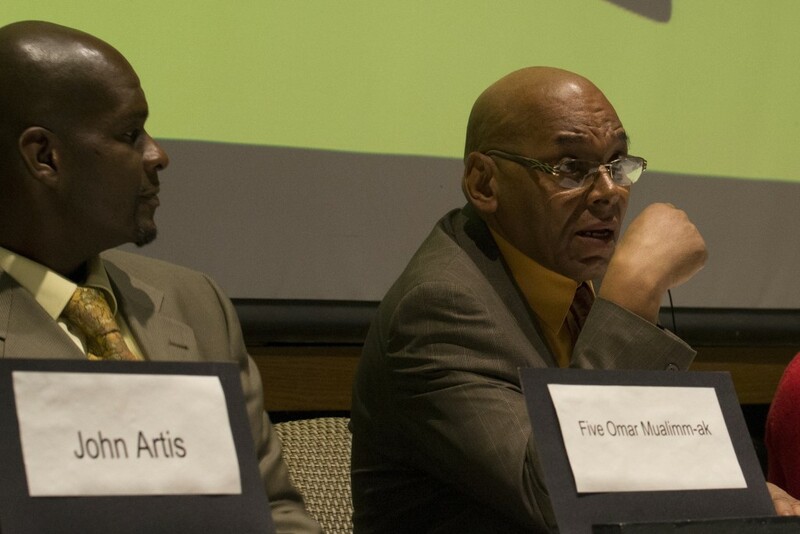 Panelists included Five Omar Mualimm-ak, activist and founder of The Incarcerated Nation Corporation, a non-profit seeking to reform incarceration methods and help integrate ex-convicts into society; Al Tony Simon, an organizer for Release Aging People in Prison, a group which aims to release elderly and infirm people from New York state prisons; Dr. Kirk A. James, a writer and a co-founder of EVOLVE, an organization working to end mass incarceration through education; and Douglas Rogers and Ashley Diamond, members of LGBTQI prisoners’ rights organization Black and Pink. All of the speakers had served sentences in prison, and all except Artis had spent time in solitary confinement. Each panelist had a short period of time to talk about their experience with prisons and the criminal justice system, according to Stannik. The next part of the discussion was guided by questions prepared in advance by Tufts Amnesty members and shared with the panelists, but Stannik said that the panelists were free to talk about whatever they found most important. The panelists broached various topics during the panel and during the question and answer session that followed, including mass incarceration and its connection to American slavery, the psychological effects of solitary confinement, the significance of the television series “Orange is the New Black” (2013 – present) and mistreatment of LGBTQI prisoners. The panelists agreed that America’s prison system, as well as said prisons’ disciplinary measures, were in need of substantial reform. Drawing a connection between mass incarceration and America’s slaveholding past, James said that the most effective way to solve the injustices caused by the modern prison system would be to abolish it entirely. Although the rest of the panelists spoke in person, Diamond participated in the discussion over Skype from her home in Georgia. According to Stannik, Diamond was released from prison for two months and is still under parole and therefore unable to leave the state. Diamond said that she still suffers from post-traumatic stress disorder. Stannik said that it is important for former prisoners to have a forum in which they are able to share their experiences. Lancy Downs contributed reporting to this article.